Outdoor Lighting Boca Raton, South Florida and Palm Beach County Florida. 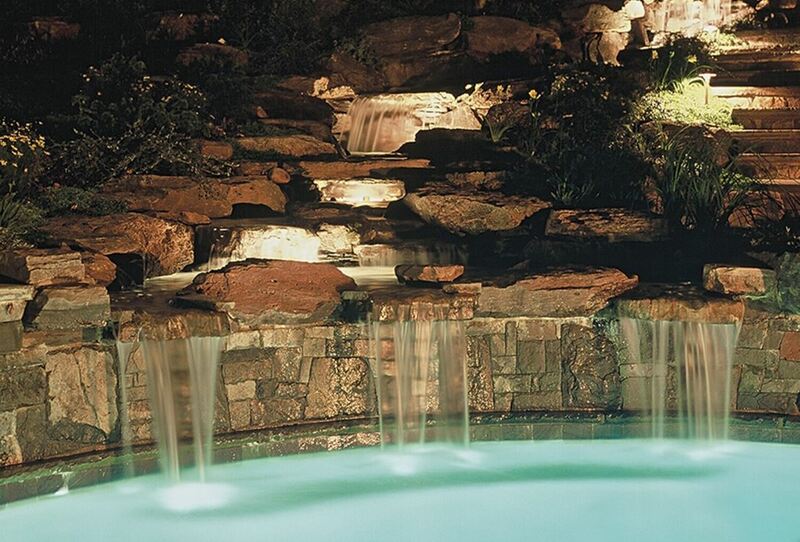 ​Out outdoor professional landscape lighting services adds to the allure and beauty of our homes. 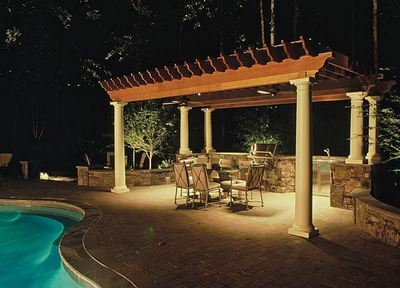 The different types of lighting like path lights, accent lights and deck lights increase the beauty of our home’s outdoor lighting and also gives us the peace of mind of a well-lit outdoor area. Lighting can create different moods and gives us a sense of tranquility at the end of a hard days’ work. Home owners are identifying the importance of lighting and are taking up the concept of “nightscaping” which is becoming a trend in outdoor home improvement of late. The insightful people realize that lighting plays a key role in landscape designing as when done properly it highlights the focal points and hides eyesores. As mentioned earlier it helps in increasing safety and accentuate special trees and plants and set the right mood for festivals in outdoor entertainment. Landscape lights have their own importance. It illuminates the path at night so it eases walking on flagstone. It also deters burglars and thefts which helps in reducing crime. 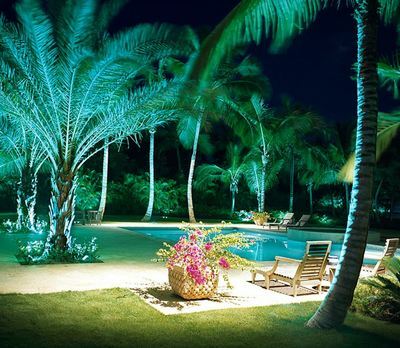 Having said that, it is a challenge for homeowners to actually identify the best way to set their lighting up and here is where landscape professionals can share their expert tips and suggest the right places to illuminate. The homeowner can get guidance on several aspects as to where the lights should be put up and how can they create magic by light and what will be the outcome of installing landscape lights and so on. 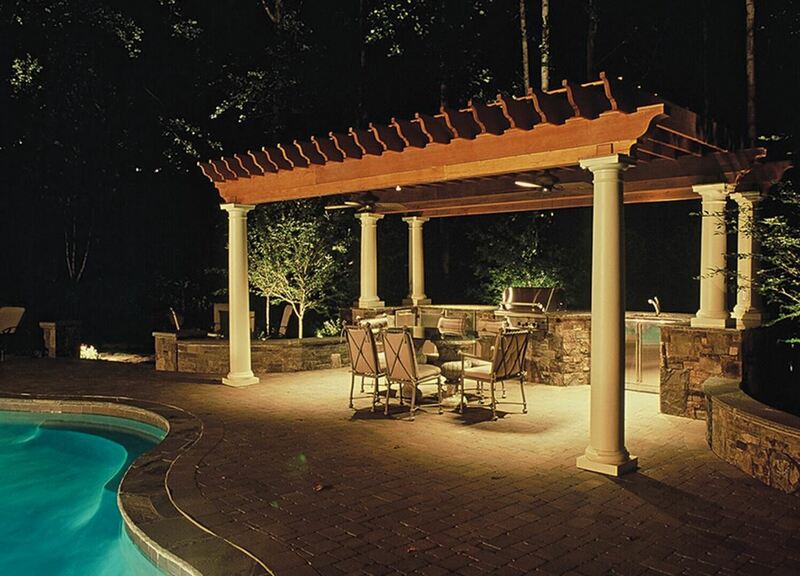 Many people think of landscape lighting as shining a direct light on a tree or illuminating the walkway and so on. Contractors work at creating an ambience with lighting as well as accentuate the architecture of the home rather than the trees and patio. Many a times it is worth focusing on a column or a pillar to celebrate the architectural wonder rather than lighting the trees or garden up. In this technique one needs to use low – voltage light fixtures with the help of Halogen or LED bulbs and the lighting is down from the ground up to highlight the shape and trunk of a tree or structure. The set up technique is to have 1 – 2 fixtures at the base of the tree which will point upwards and highlight the main trunk structure. To capture the canopy and the branches and leaves a fixture needs to be placed about 8 – 10 feet away from the trunk. In this set up the light is kept high in the tree and aimed downward. This is a good technique to down light a patio. The fixtures need to be set up high up in the trees in several locations which throw a cross light on the hardscape below. To get this effect we need to put up a spread light between plants, sculpture, fountain and an adjacent structure. the effect of this is the object is silhouetted in black on a white background. Spread lights are usually bi – pin halogen bulbs which have a mirrored background. This helps in creating clean white light which further helps in backlighting the structure to create the silhouette effect. The fixtures will depend on the area of wall that needs to be covered by light. In this the object is lighted in such a way that its shadow is cast on the wall or a fence. This playing of light and darkness invokes intrigue which increases when affected by the breeze. When the object is lighted from below and angled upward it can create a larger than life effect. To make the architecture or stone work the focal points, place spread light or up lights right next to the wall with their beams aiming upwards. This will create a shadow that will capture the texture of the wall. This technique highlights the stone work on pillars and walls. When planned properly grazing and silhouetting can be combined. The basic idea here is to create the lighting to keep the walker safe. All turns and obstacles should be well lighted to avoid any stumbles. The lighting should be set up in a way to guide the walker where he gets an idea which path should he take. By making it alluring you can entice the walker to keep on walking to see where the path would lead to. In this technique simply place the light beside the object that you want to illuminate and let the light flow over it where it lights up an entire wall or a row of bushes. This will create a nice soft glow over the whole area. Keep on experimenting with the height and angle of light to see which gives the best result. Check out some examples on our website. In the end it is important point out certain things like putting a light on top of pilasters need to be placed properly. Lighting only the top of the staircase will cast shadows down the steps where it will get difficult to judge the distance between the steps and can create a mishap. Lighting can do wonders where it serves the practical purpose of illuminating an area, it also does wonders to the surrounding area. It helps in highlighting certain areas or objects and can help in setting the mood too. However, there are certain aesthetics of lighting that need to be followed so as to avoid any kind of unsavory events or discomfort. If done properly, it adds allure to your mundane outdoors. We've also done some sick outdoor kitchens.